Despite a little rain here and there we are well on our way to summer - school gets out very soon and then it will be nothing but fun in the sun for the next three months! We got in all of our summer inventory early this year, when the first warm spell happened. 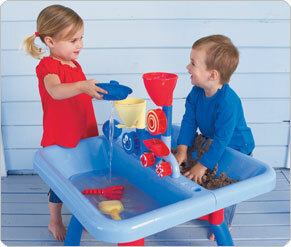 One of our favorite items for summer fun is the sand and water tables. This year we have the new model from ELC, and it comes with tons of great accessories to help teach kids the basics about some fundamental physics like energy transfer and fluid dynamics (Its never too early to start! ), as well as basic cause and effect, and the fine art of making sand castles (or mud pies for the little ones). 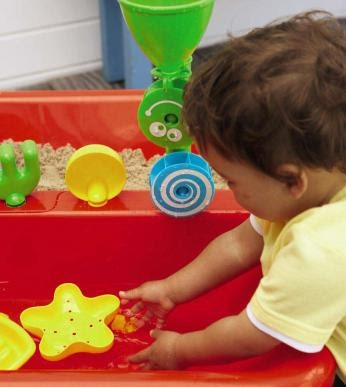 One of the most common questions we get from parents about the sand and water tables is where to get the sand, as it is not included in the box. We recommend that you go to any lawn and garden center as they usually carry bags of sterile sand for potting plants and decorative purposes. A small bag is all you need and they are very inexpensive. People also ask if it is okay to use just water or just sand in the table and it is fine. If you are looking for a way for kids to get as much out of the tables as possible but with a little less mud you can just use one or the other. 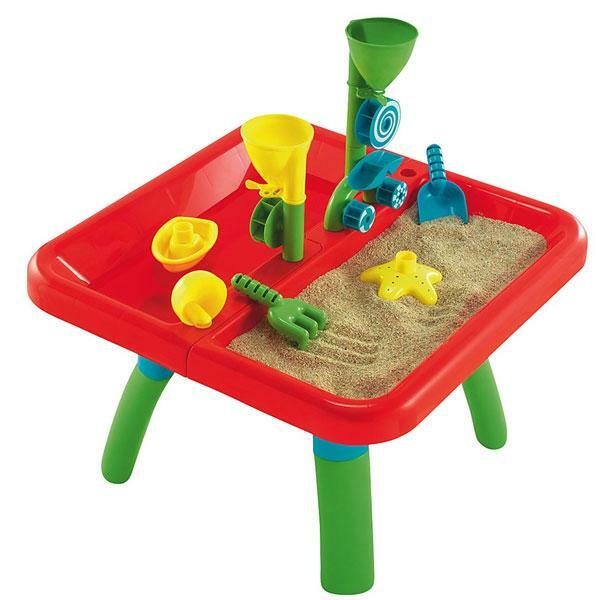 While the sand and water tables are great fun for the backyard or patio we also have lots of other sand toys in our stores for those who like to get down to the beach or sandbox as much as possible. Buckets, shovels, sand wheels, sieves, funnels, and more are all in stock now along with our usual assortment of great outdoor toys. Bubble buckets or machines, Foxtails, Frizbees, and Stomp Rockets are all great to keep the kids happy outdoors. Ask any store employee about these if you aren't familiar with them, you won't be disappointed! Hello! We here at A Child's Delight are committed to bringing you the best in toys, games, and gifts to encourage your child to be creative, exercise critical thinking, and most of all, to have fun! We hope you enjoy visiting our stores, and we always love to hear about new products and anything else we can do to make your shopping experience the best we can! We now have 3 convenient locations to serve you! Mon. - Fri: 10:00 a.m. - 8:00 p.m. Sat: 10:00 a.m. - 6:00 p.m.
Mon. - Sat: 10:00 a.m. - 6:00 p.m.
Mon. - Thurs: 10:00 a.m. - 6:00 p.m.
Fri. - Sat: 10:00 a.m. - 7:00 p.m. There is free gift wrapping at all locations! Join Our Mailing List and Receive Coupons and Newsletters! A Child's Delight on Facebook! A Child's Delight SF on Yelp! A Child's Delight CM on Yelp! A Child's Delight SR on Yelp!